I loved that theater! They showed a little bit of everything from James Bond movies to Elvis flick, and italian art films! The best popcorn, and that automated Fanta soda machine with the drop down ice, and the syrup and then the water! It was a big theater, and I lived right wround the corner from it! We moved away from Mt. Elliot in 1969, and I spent my summer in the south in 1968, so I had no idea it had closed before we moved away! Saw a lot of great classic/rae films there. My first was The Money Trap with Glenn Ford. It was playing with The Return of Mr. Moto! Also saw many a horror movie there! Queen of Blood! Lot of Hammer Films! Plenty of Spy Movies! I was just a kid, yet I saw Bonnie and Clyde, and The Valley of the Dolls there. When my dad moved us away from that area, I caught the bus with my new friends downtown to the Fox, the Grand Circus, the Adams, and the Palms. I am so disappointed that there are no pictures of this theater, anywhere!. This was a movie palace and I spent much of my youth here. During WWII my mother took me here via a wagon since as a small child, I could not walk very far. She was a young mother and saw the films as a diversion. It was my first film experience. My sister and I spent many weekends here watching everything that was available. It was a magnificent structure and I measure all theaters by what I first saw there as a child. I remember the bank on the corner of Gratiot and Mt. Elliot and the legless man on the side of the bank, selling pencils. The bank building still stands buying and selling gold. The theater building is long gone but it was the most magnificent movie palace in the neighborhood. A lifetime of films began here for me and still continues, although with more discrimination. Google street scape still shows the vacant site. I will never forget this place. This C. Howard Crane-designed theater opened in 1917, and featured an early form of stadium-style seating, with a steeply sloping auditorium floor. Therefore, there was no need for a balcony and it could seat around 1350. 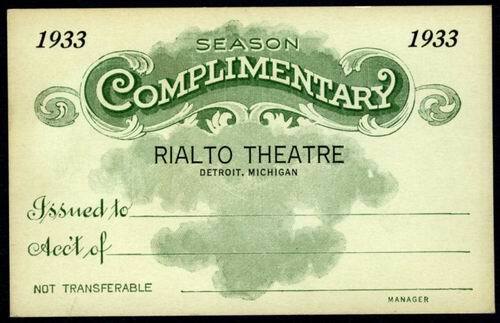 The Rialto's exterior was very similar to his Capitol (now the Detroit Opera House), which was built in 1922. The Rialto closed in 1968, and has since been demolished.